Fresh is best. That’s essentially the credo at Dean’s Seafood Grill & Bar, Cary’s newest outpost for well-prepared fish and other sea-centric fare that was likely hauled in just days before being served. The restaurant’s primary hook? An impressive seafood menu that changes weekly and features seasonal offerings from around the country — including Alaska and Hawaii — and beyond. Whether it’s mahi mahi, Corvina sea bass or Opelu Kala (unicorn fish), variety abounds. Of course, then there are selections like rainbow trout and bigeye tuna caught right here in North Carolina. Seafood and shellfish are available grilled, pan-seared or fried — or, in the case of oysters and clams, raw or pan-steamed. 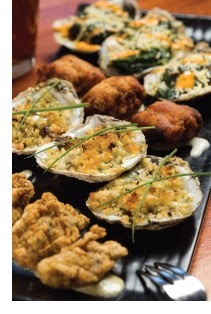 Oyster enthusiasts would be well served to order the sampler, which features bacon-wrapped, casino, Rockefeller and buttermilk-fried. Standout seafood specialties include pistachio-encrusted salmon served alongside impeccably grilled asparagus; shrimp and scallop gnochetti suffused with sundried tomatoes, artichoke hearts, Kalamata olives, capers and prosciutto; and blackened fish tacos containing chipotle ranch slaw and tomatillo-cilantro salsa. More than a dozen distinctive “accompaniments” range from Thai peanut sauce and lemon-tarragon aioli to mango chili sauce and cumin-tinged spicy harissa garlic butter. 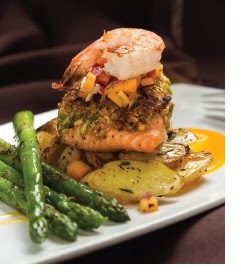 If you’re not in the mood for seafood, a “food without fins” menu section offers tantalizing choices such as the wood-fired filet, ribeye, New York strip and even a double bacon burger with smoked blue and hoop cheddar cheeses. An orange-mint-marmalade-infused pork chop is another winning option. Save room for dessert. Among the nine irresistible choices, you can’t go wrong with white chocolate banana bread pudding, peanut butter brownie cake with warm chocolate ganache, or the vanilla bean crème brulee. Most desserts are sized to share, especially the indulgent chocolate sampler with enough goodness for two people or more. Proprietor Dean Ogan, owner of Rocky Top Hospitality, which also runs local establishments Twisted Fork, The Daily Planet Café and Rocky Top Catering, opened Dean’s in January 2013 and considers his newest establishment a comfortable place with something for everyone to enjoy. When it comes to libations, 14 craft beers are presented on tap, and more than 80 wine selections plus a signature cocktail list vie for consideration. Nightly specials are an attractive draw, including happy hour in the bar from 5 to 6 p.m., with half-priced oysters, shellfish, appetizers and $5 burgers. A tempting Sunday brunch buffet, which is served from 10 a.m. to 2 p.m., features all-you-want oysters and peel-and-eat shrimp. An upscale casual décor features deep ocean blue walls and attractive earth-tone striped banquettes. 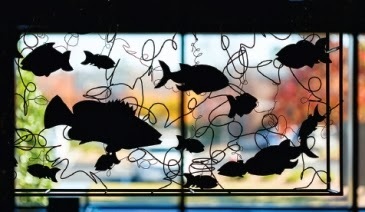 Custom aquatic-themed sculptures created by local metalsmith Nelson R. Smith are showcased in the center of the dining room. What’s more, the walls are adorned with black-and-white framed photos from Ogan’s various globetrotting excursions. That fake rolex for sale will be an an automatic sit back and watch, therefore it will be battery powered via the herbal move belonging to the wearer's limb as a substitute for battery. Running watches can be bits of expensive jewelry at which almost everyone will wear them all; furthermore they try to make much of our everyday life well timed and even opportune, though also are thought about an important designer thing which will includes pattern. Almost all the rado replica, notably fellas, enjoy them all really with regard to showing ones own grace and even pattern. Coziness want having on a lot of these running watches to help you accessorize much more than all other expensive jewelry supplement. Certainly the house keys with the achieving success belonging to the running watches is without a doubt running watches openness to help you always reinvent once more throughout you'll find it audemars piguet replica that are available. A single thing with crafted that running watches as a result well known is without a doubt that should be offered for sale within a rate which is provided as a result of just about anybody. Quite a few people possibly even order a unique rolex replica uk after the battery expired to their up-to-date sit back and watch. What exactly odd within the Ironman sit back and watch is without a doubt that should be continually sighted in the arms in politicians, clinical doctors and even political figures, which inturn takes it to reveal which will even while an important Timex ironman sporting sit back and watch will be an cost-effective sit back and watch, rolex replica sale is known as a value-based product which is not thought about running watches.